Any umb-er-ellas to MAKE today? 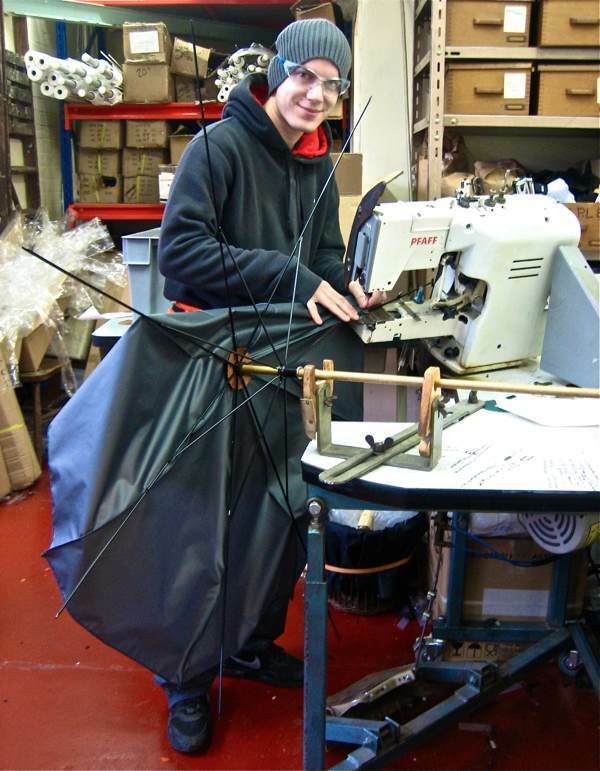 It was the son of a shuttle weaver in Derbyshire who gave us the umbrella shape that we are so used to today. Before Samuel Fox (1815–1887), a wire drawer, developed the u-shaped frame, the ribs of umbrellas and parasols were straight, with a hinge which allowed them to be folded. They were also very heavy, made out of wood with a stout handle which was sometimes 2·5 cms, 1 inch wide. The oldest written record for a collapsible umbrella is dated 21AD in China, and they often had a ceremonial role as well as a practical one. This ceremonial role spread to Japan, India and Persia. 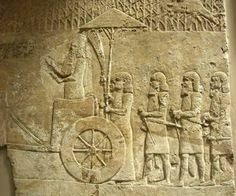 This Assyrian wall carving at Ninevah shows umbrellas being used perhaps as part of a ceremony, or perhaps just to keep the fierce sun off the king. 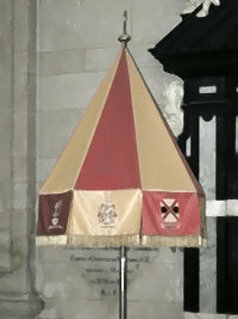 The papal ‘Umbraculum’ has wide gold and red stripes, and is usually quite pointed. It was once used to protect the pope from sun, but now has a significant ceremonial role. All Roman Catholic basilicas throughout the world have the right to have an umbraculum indicating the authority of the Roman Catholic Church, and the umbraculum is usually placed just to the right of the main altar. When the pope visits the basilica, the umbraculum is opened. In 1852, Samuel Fox was said to have used left-over stocks of steel stays (from corsets) made from spun steel to construct the metal ribs on his Paragon umbrella (see right), which gave us the characteristic u-shape that we are so used to. Making umbrellas is still a craft process with a great deal of hand work from skilled practitioners. 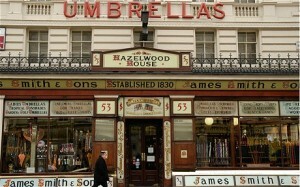 The oldest umbrella-maker in the country is James Ince & Sons in Spitalfields in the East End, founded in 1805. Richard Ince (shown right cutting out the pieces of fabric to make covers) is the sixth generation umbrella maker. 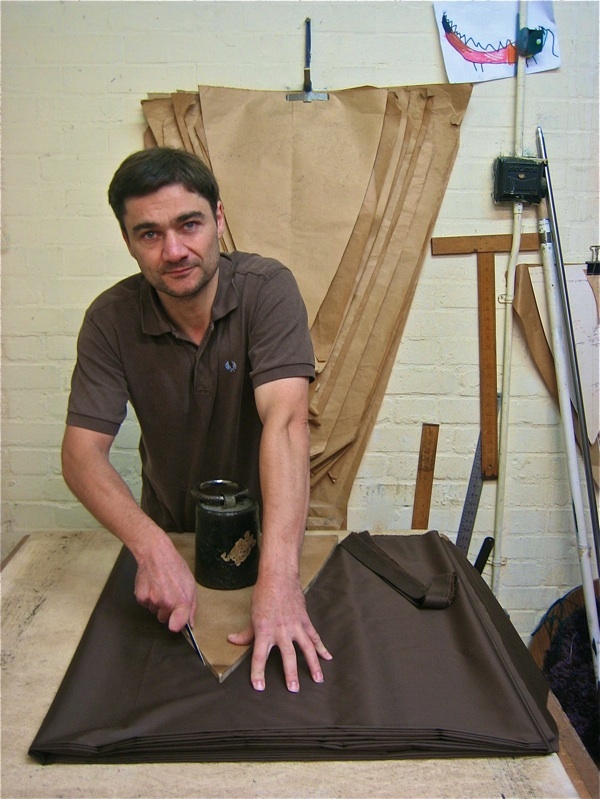 The covers are sewn together in pairs which are in turn sewn to make the eight panels of the canopy. This is then fitted over the metal frame and stitched to the ends of the spokes. The metal ferrule and handle are attached and the cover finally ironed on to the frame to ensure a perfect fit. 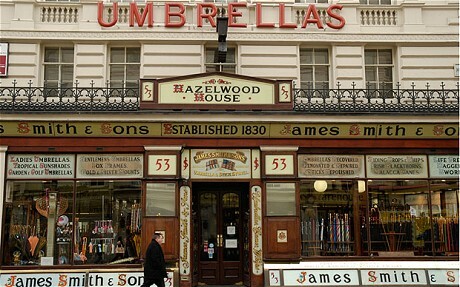 The oldest shop selling only umbrellas is still in London on New Oxford Street. James Smith and Sons is pretty much the same as it was when it moved here in 1857 (the first shop opened in 1830 in Foubert Place). 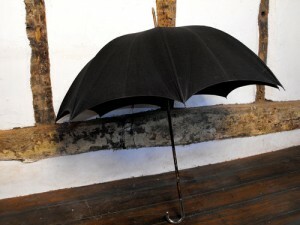 This entry was posted in Blog, Interesting stuff and tagged Chinese umbrella, Derbyshire., James Ince & Sons, James Smith and Sons, paragon umbrella, Richard Ince, Samuel Fox. umbrella, Spitalfields on 18 February 2014 by Patricia.